It only takes a few minutes of listening for you to realize that... well... Mario is actually a man driven by love that\'s willing to destroy whatever he likes in order to get back to his girl. At least, that seems to the theme behind Freakout, the second of four songs on Jonathan\'s Mario Opera site available for listening. Other songs are forgiving to Mario, who participates in the story as the one person that does not know he\'s the hero. In fact, from the description, the opera is Mario\'s journey of self-discovery, an ordinary guy that learns he has a bigger role in life. Currently, only Act I of the opera is completed, but considering the concept behind the opera and the difficulty of building even that one act, one has to admirer the people putting it together. The sounds of the opera are heavily Rock and Roll influenced, but certainly have that Mario Brothers flavor as well. 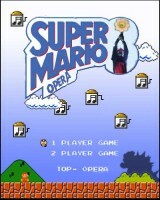 While it\'s not Pink Floyd\'s The Wall or Phantom of the Opera... it is... well... a Mario Opera. How much more could you ask for? Certainly it\'s worth listening to, if anything just for the novelty of the experience.